Our McKinney Wedding Photography system allows us to display the image on the camera's screen or any television for an instant review of your images. At "Wedding Photographer McKinney" we have eliminated all the danger areas that plagues film photography, upgrading your photos to our state-of-the-art wedding photo technology to ensure your complete delight! 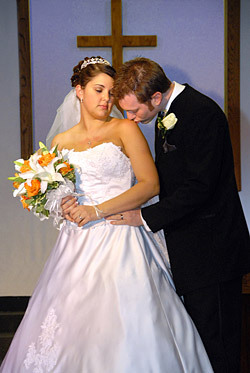 Wedding Photography McKinney also includes, in each of our wedding packages, a CD of all your photos. This CD master is yours to keep. You can take your CD to any photo store and receive prints of your size at your time. This is the ultimate in flexibility and freedom. Email to friends, make unlimited prints...the choice is yours.